Streaming devices are cool gadgets that enables streaming easily. Unlike the streaming media, they are multimedia that is steadily received by and presented to the end-user while being brought to access by a provider. Just like your playstation, Xbox, Wii and many more, they are cool streaming media, but it's time you give a break to those and purchase the best streaming devices. Today's stroll, I would brief you guys on the top 4 Best streaming devices to purchase in 2014. So just relax, and get to know some certain reasons you should purchase those devices through the brief features of the streaming device that would be explained below. Chromecast is one of the coolest media streaming device that is being manufactured and developed by Google Inc. It was released on the 24th of july 2013 in United States and the inductory price was placed at $35 (Still within that price till date) and the system-on-chip that is used is Marvell DE3005-A1 and the memory is 512 RAM DDR3L with storage memory of 2GB. It's display is 1080p with a HDMI connectivity. The chromecast supports, Youtube, Netflix, Google Play, Twitch, Hulu Plus, MLB.TV, HBO Go, Watch ESPN and some other embedded videos from chrome browser. To make full use of the chromecast, there are some few basic requirements, like, a HDMI port, Wi Fi, a wall outlet for power or a USB port and also a device in which you can easily broadcast from (Like Androids, Tablets, iOS or computers containing chrome browser). The chromecast is actually a good device to start with, and it's quite affordable, so I advice you get one for your self. You can go make an order from amazon. This is another great streaming device that is quite powerful with loads of features. The Amazon Fire TV is manufactured and developed by Amazon and was released on the 4th of april 2014. The introductory price was $99 (still within that price range) and it makes use of Fire OS 3.0 “Mojito” as it's operating system. It makes use of a 5.5mm DC power and the system-on-chip uses Qualcomm Snapdragon 600 APQ8064T and the CPU is Qualcomm Krait 300, quad core to 1.7GHz. It makes use of a 2GB RAM with an internal storage memory of 8GB. It's display is 1080p and the graphics type is Qualcomm Andreno 320. It has a cool audio effect with a dolby digital 5.1 surround sound. It's connectivity acquires a HDMI, Bluetooth 4.0, USB 2.0, Wi Fi, Ethernet, optical audio and the fire game controller. The Amazon fire TV supports any Amazon instant videos or musics, Netflix, Hulu Plus, Showtime Anytime, WWE Network, Pandora, twitch, Watch ESPN, iHeart Radio and Crackle. It also has some basic requirements for full functioning, like the Wi fi or ethernet connection, AAA batteries for it's remote and the HDMI port. The Amazon Fire TV is really a cool streaming device and I recommend you also make a purchase for it. It's also available for purchase at Amazon. Roku 3 streaming media player is also one of the best streaming device you should purchase this season. It's really a great streaming device with loads of features that comes along with it. Roku 3 Streaming Media player is very fast and powerful that let's you stream over 1,000 channels of movies, sports, TV shows and more to any HDTV. You can plug a headphone into the motion-control remote in other to play games or even watch late-night flicks without disturbing the hood or household precisley. It's display is 1080p and its dual-band wireless and fully loaded with one-stop search. Other connectivity access like ethernet and USB is also available. The Roku Streaming device also supports Netflix, Hulu Plus,Amazon instant Video, Redbox Instant, HBO Go, WWE Network, Crackle and many more. To Enjoy the Roku 3 streaming device, they are some basic requirements that you should consider, like, a Netflix or Amazon subscription, HDMI, AA battery for the remote and also Wi Fi or ethernet connections. You can purchase the Roku 3 streaming media player for just $89. Simply make your order at amazon. 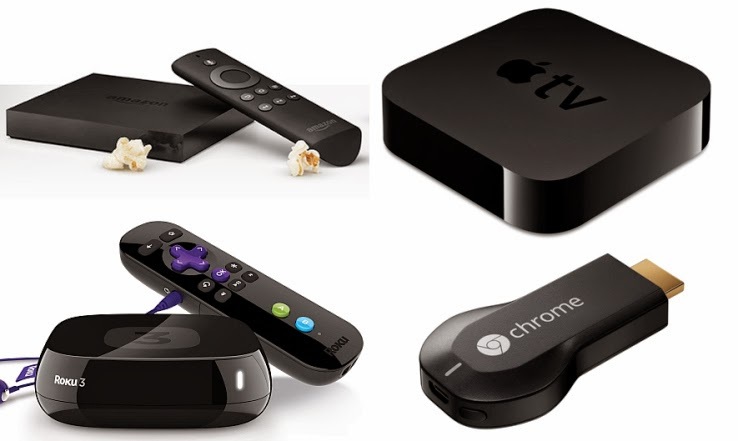 Apple TV is another great streaming device that is manufactured by Apple Inc. This device was firstly released in 2007 and updated on the 28th of january 2013. This streaming device costs $92.95 and its loaded with lots of features. It makes use of the latest iOS 8 as its operating system and Apple A5 as its CPU. It has a 512MB RAM and a storage memory of 8GB. The inputs are, the Apple wireless keyboard, Apple remote, iPod, iPad or iPhones (via Remote). It also bluetooth, ethernet and Wi Fi enabled, with optical audio, Micro USB and HDMI. The Apple TV also supports some online services like, Beats Music, Crackle, HBO GO, Hulu Plus, iTunes Radio, Crunchyroll Disney, Flickr, iTunes Store, Netflix, Sky News, Watch ESPN, Youtube and many more. You can also purchase the Apple TV on amazon. What do you think? Are those streaming device great or not? I advice you purchase any of those streaming device mentioned above, it would do you good, and they are quite affordable.